“So I decided to summarize the conclusions I had drawn from all these experiences, over all these years. . . .
1. Consciousness has legitimate dimensions not yet guessed at. 2. At least some psychic phenomena are real. A SHOT TAKEN from a helicopter hours earlier, just before sunset, caught the size of the crowd massed at the abandoned air base outside Berlin for the live performance. It seemed an eerie reminder of the old photos of the 1963 Civil Rights march on Washington, when the sea of faces listening to Martin Luther King filled the Mall from the Lincoln Memorial back through the Reflecting Pond toward the Capitol, bodies packed together as densely as blades of grass. That was no coincidence; that was one more carefully planned part of the Twisted Messiah message. Nor, of course, was the name Twisted Messiah a coincidence. THE DIRECTOR CUT FROM BERLIN to shots of the other audiences in Munich, Paris, Sydney, Miami, all sitting as quietly as church-goers; it was as if the same young faces had been cloned in cities around the world, a rag-tag army in dirty clothes, unkempt hair, rings in noses, lips, cheeks, ears, and assorted tattoos. Skinheads co-existed alongside kids whose long hair was streaked day-glo purple and chartreuse. Some of the faces were tattooed beyond recognition, several with death-head skulls like the performer in the Toilet Video. All in all, they were the kind of lost kids seen on the streets of any city, messy kids with angry, unhappy faces, hanging out together to pass empty days. Yet there were also very ordinary-looking kids among them, kids no different in looks than ones you see walking home from school, or wandering the malls. It was those “ordinary” kids, I’d find out later, that the intelligence agencies and police considered the real threat. They were, in the term first used by Cal Katz, “the world’s worst nightmare” because they looked so ordinary. They looked as normal and harmless as the kids down the block, yet were indoctrinated in the Twisted Messiah outlook. They were the sleepers who could do the real harm if they were awakened. The silence in the stadiums was chilling: tens of thousands sat immobile, as if waiting for the Rapture. These were not just fans, I realized, these were cultists. IT WAS NIGHT IN BERLIN. The lights dimmed, and the crowd stood in a wave that rolled a half-mile along the runways. A single spotlight found Jesse Cripes. He raised both hands, as if giving a blessing, then walked slowly up the aisle to the stage. The other members of the group followed a dozen paces behind. A drum beat a march rhythm. The spectators stood in reverent silence. Jesse wore his trademark beard and shoulder-length blond hair. Coupled with his usual ankle-length loose robe and sandals, he was a look-alike for the Jesus of the holy pictures—though the image was jarred by his fluorescent orange and hot purple robes. He arrived at center stage and turned to the audience. The hush continued as he reached into his robe, pulled out a pack of cigarettes and lit one. The brand happened to be one of the corporate underwriters of the world-wide telecast. He held the pack up to the cameras and waved as if to say, Join me, and the kids in the crowd did, and held up their cigarettes as if to say to the world, We do what we want, We do what Jesse wants. Hundreds of thousands of hands, held into the air, waving like a vast field of grain in the breeze. And uncannily like those old newsreels of the crowds at Nuremberg , right arms raised in tribute to Hitler. The Hitler Salute had been banned in Germany after the war, but who could object that this was anything political, this was just some kids flaunting their right to smoke. Isn’t what turns you on. Is what turns your stomach! I caught a shadow passing across the screen behind the stage, then another. Part of the show was an array of lightning-fast visuals flashing across the sub-conscious, synchronized with the beat of the music. Each lasted only an instant, not long enough for the eye to focus, just long enough for the image to register somewhere back in the mind, triggering intriguing dark impulses. Scary, horrifying images balancing arousal and disgust. Yet magnetizing. That scene from their old video of the couple copulating in the grungy public toilet. A pair of naked girls, wispy blonds with pre-pubescent breasts, straddling a black—no, not a man, it was a decaying corpse. “Do it! Taste it! Screw it!” the audiences around the world roared along with Jesse to wrap up the piece. Something I noticed only then: the kids in the audiences were all wearing sunglasses—or something more like the plastic glasses for 3-D movies. Were they seeing something that the rest of us did not? JESSE LED THE CHANT; as his tempo and volume built, the music rose to match it, a peculiar mix of rock in a march tempo. His gestures were jerky, almost mechanical, so he seemed like a strange puppet dancing in synch with the music and words. The camera moved in for a close-up as he finished. His eyes were blank, rolled back in his head, and the words shrieked out of lips covered with a fine foam. His face gleamed with a weird intensity, the sweat casting a sheen across his porcelain-white skin. We move with a Different Power! We follow a New Cross! Jesse raised both arms and crossed his hands over his head, forming the asymmetrical X of the New Cross—the proportions of the Christian cross, twisted onto its side as if broken off at the base. Now the director shifted to another camera, and the flaming red X—the New Cross—appeared in the night sky over Berlin, a holographic image beamed up, a gyrating apparition in the dark night. We follow the Twisted Messiah! We are the world’s worst nightmare! We are the bringers of destruction! THE LIGHTS CUT OFF, leaving the arena and the screens around the world black. Total silence for a long moment before the lights flashed on again. I DIDN’T GET MUCH SLEEP AFTER THAT SHOW. I don’t think anyone did, not with police and fire sirens racing past through the night, and not with those nightmare images imbedded from the spectacle. I finally got up around five. I flicked on the TV and stood transfixed, morbidly fascinated by the scenes of the overnight riots: Flash-mobs of Twisted Messiah fans in cities around the world burning, looting, and destroying as a way of celebrating last night’s concert. The hype had been building for weeks. An estimated 500.000 fans from all over the world had been gathering at the concert site, an abandoned air base in the former East Germany, not far from Berlin. Most had been camping out there despite the October chill, and more were on the way. The live concert had been beamed by satellite to audiences around the world. The earlier mobs had been relatively small-scale, and politicians and police had mostly opted to hold back, not wanting to risk provoking bigger riots. You’re about to set off a storm that spreads around the world! Have crucial new info regarding our recent conversation. We need to talk, ASAP! You’re involved, like it or not. It sounded like just another bubble in that vast ocean of jokes floating around cyberspace. But this was hand-printed in the distinctive scrawl of Cal Katz, as thick and stubby and intense as the man himself, and Cal was definitely not into jokes. He was a strange little guy, one day hush-mouthed and conspiratorial, the next day ready to tell you more than you ever wanted to know about what was really going on behind the scenes in Washington. A conspiracy nut, but an intelligent one who did his homework . . . obsessively. Have important info regarding our recent conversation: Typical Cal, at the same time both paranoid and forgetful: Which part of which recent conversation? Why am I the butterfly? Why watch my back? 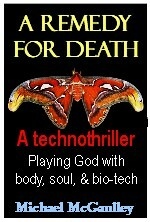 To Cal, everything was of life-and-death importance. That conversation, a week or so ago, hadn’t been so much a conversation as Cal talking at me about his latest project, an upcoming expose of Twisted Messiah. Then, in one of his characteristic mind-jumps, he’d asked whether, by any chance, any relative of mine had served in the OSS during World War II. Strong words, typical Cal Katzian exaggeration, I’d figured. At that time, the possibility seemed bizarre. But that was before the “celebrations” had begun. The feedback to the Post reflected that: Rock stars as a world-wide political force? Get real! Alas, as events turned out, Cal wouldn’t live quite long enough to see his prophecy coming to life. HIS MESSAGE was on my mind as I showered. You are the butterfly about to set off a storm that spreads around the world! “Butterfly”—I understood that much of it. The term came from Chaos Theory, suggesting that small, unanticipated events, like the tiny puff of wind set off by the wings of a butterfly, can trigger a chain of events that bring about major, unpredictable change. But me as a butterfly? Not likely. I was just another faceless soldier in that army of Beltway Bandits living off government contracts. I had no politically embarrassing documents to leak, no secrets the media or anyone else would find the least titillating. But a storm was brewing, and I—the 180-pound butterfly— was indeed about to set it off. That storm would spread, and merge with another storm, and before it all ended, less than a week later—on Election Day, no coincidence— things would be changed forever, not just in my life, but in Washington, in the Establishment running it, in politics, in the whole country. Changed even in how we human beings view the world and what is possible within the reality we experience. The Grail Conspiracies is available in both e-book and p-book editions. Copyright © 2007-2015 Michael McGaulley. All rights reserved. This is a sample. For complete copyright and legal matters, please see the section at the end of the complete book.